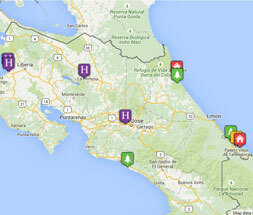 Tribes Overall: "Costa Rica is a fascinating, vibrant and diverse country, safe too. We look forward to a return trip"
Tribes Service: "Booking service and preparation both thorough although internal flight options were not offered and there was no explanation of the internal minibus system, (the exchanges of buses/drivers somewhat bewildering at first.) The arrival experience at San Jose airport was poor: the promised "local respresentative" was in fact from another company not from the anticipated company. The greeting system was muddled and disorganised with a consequent long delay which was not a good start especially after a very long flight. This did not properly reflect the " tailor-made" aspect advertised by Tribes. Tribes Comment: The greeting service inside the airport terminal is arranged through a national company who is permitted inside the baggage area - other representatives must wait outside the terminal building. On this arrival there were delays processing the flights which caused hold-ups at the airport. We are in discussion with the local representatives to improve the service at the airport." Guides: "Very knowledgable, all deeply committed to matters "green" and the preservation of their natural heritage. A shame however that our guides had to try to cope with so many people at once." Appallingly offhand initial greeting redeemed somewhat by the character and peace of the lodge. Overall rating is probably good, but ruined by the arrival. In addition, Casita lighting was far too dim - we wished we had brought head torches! Comfortable, communal, very busy, far too many people, tours at wrong time of day and overcrowded. Apart from the boat trips, it was rapidly clear that the best way to see birds/animals was to ignore the tours and remain at the lodge and let the wildlife come to you whilst all the visitors were elsewhere! "Despite some irritations, (most of which with greater attention to detail could be easily resolved) , we very much enjoyed the opportunity to visit a country rich ( and proud) in bio-diversity and look forward to a return visit"